Sorghum grain (Sorghum bicolor (L.) Moench) is used by various food industries, including milling, starch production, brewing and distilling, resulting in numerous by-products. Sorghum bran (sorghum offal, sorghum milling waste, sorghum mill feed) is a mixture of grain pericap (bran) and of variable amounts of grain fragments (endosperm, germ). It is usually a by-product of the dry milling in sorghum flour manufacturing, but the manufacture of other sorghum-based food products may also require a dehulling step. This is because the pericarp contains tannins that decrease food value and organoleptic qualities (Lazaro et al., 2000). The removal of hulls and bran is done manually by pounding in a mortar and pestle, or mechanically through the adaptation of barley pearling machines (NRI, 1999). Sorghum brewer's grains (sorghum brewers' grain, sorghum brewers' spent grain, sorghum spent grain, draff, sorghum beer residues) are the by-product of brewering based on sorghum grains (other grains such as barley, maize and rice are sometimes included). They can be used fresh or dried (artificially or sun-dried). Sorghum has been the basis of traditional African beers, such as the clear beers of West Africa (dolo and pito) and the opaque beers of southern Africa. Though the diastatic power of sorghum malt is very low, certain stout and lager beers are now produced in Africa using malted sorghum rather than the imported and more expensive barley. Chinese beer is normally made of malted rice and barley, but sorghum is also used (NRI, 1999; INTSORMIL, 2008). Sorghum brewers' grains originate from industrial facilities or from small scale units (INTSORMIL, 2008). Malted sorghum sprouts are another brewery by-product, similar to barley culms (sprouts and rootlets). Sorghum distillers dried grains and solubles (sorghum DDGS) are the dried by-product of the manufacture of alcohol (beverage or fuel) from sorghum grains or from grain mixtures in which sorghum grain predominates. Starch content and ethanol yield from sorghum grain are comparable to those obtained with maize, and the use of sorghum grain alone, or blended with other grains for ethanol production, has been increasing since the 2000s (Tokach et al., 2010). Sorghum wine residue is the by-product of the manufacture of traditional sorghum liquor ("sorghum wine" or kaoliang 高粱酒) in China. Sorghum gluten feed is a by-product of the manufacture of sorghum starch or syrup by wet milling. It is the sorghum equivalent of the corn gluten feed and consists of a mixture of bran, steep liquor and other residues. Sorghum gluten meal is another by-product of sorghum starch extraction. Like corn gluten meal, sorghum gluten meal consists of the gluten (protein) fraction of the grain that remains after separation of fibre and starch. Sorghum germ meal (sorghum oil germ cake) is another by-product of sorghum starch extraction, consisting of the germ of sorghum grains from which part of the oil has been pressed. Sorghum is the 5th most important cereal grain in terms of production (ISI, 2008) and part of the grain production goes into processing. In 2006, about 1.2-2.3 million t of sorghum were used for ethanol production in the world (Taylor et al., 2006). Assuming that ethanol production yields 35% distillery by-products, sorghum DDGS at that time was about 0.4-0.8 million tons. In the USA, roughly 29% of the sorghum produced is being utilized for ethanol production (Jessen, 2010). Sorghum brewer's grains are available in regions that produce sorghum beer (clear or opaque beer), notably in Africa. The main producers of sorghum beer are South Africa (150,000 t/year sorghum grain is used for malting), Nigeria, and Zimbabwe. Total opaque beer production in industrial breweries of southern and eastern Africa is around 1700 million L/year, but it is assumed that twice this volume is home-brewed (Taylor, 2003). Sorghum is not widely used in the starch industry and the production of sorghum gluten feed and gluten meal is limited (Taylor et al., 2006). Sorghum bran and sorghum milling offal have a chemical composition close to maize bran, with a moderate protein content (about 12% DM), moderate fibre (ADF about 12% DM) and residual oil (6% DM). They contain slightly more lignin than maize bran (5 vs. 2% DM). However, the composition of sorghum bran depends on the relative proportion of milling residues: pericarp, germs and endosperm particles. Like other spent grains from the brewing process, sorghum brewers' grains are relatively rich in protein (26% DM) and contain a good amount of fibre (ADF 25% DM). The composition is quite variable: in Africa, beer is produced by a variety of processes, from village units that produce traditional beers to large industrial breweries. Also, sorghum may not be the only grain, and maize or barley can be included. Sorghum distillers' grains have typically a higher protein content than corn distillers (33 vs. 30% DM), more fibre (19 vs. 14% DM) and a slightly lower fat content (9 vs. 11% DM). Due to the higher protein content, sorghum DDGS contain more amino acids (especially lysine and branched amino acids) than maize DDGS (Sauvant et al., 2004; Tokach et al., 2010). There is little information available about this product. It appears to have slightly more protein than corn gluten feed (25 vs. 22% DM). Sorghum gluten feed has a bitter taste and should be mixed with a more palatable ingredient such as molasses (Göhl, 1982). Sorghum gluten meal is mainly a protein source but with a much lower protein content than corn gluten meal (48 vs. 67% DM). Like maize germ meal, products traded under this name have a chemical composition with an extremely large range. A product from Sudan has a relatively low protein content (about 12% DM) and contains a lot of oil (18 to 30% DM) (El Zubeir et al., 1993; Hulse et al., 1980). Other sorghum germ meals have a much higher protein content (28% DM) and less oil (9% DM) (Cirad, 2008), while others have an intermediate composition (Watson, 1970). Sorghum and its by-products may contain cyanogenic glucosides. Inconsistent results have been reported for brewer's grains in Nigeria, from total absence in spent grains from red and white varieties (Adewusi et al., 1994) to levels higher than safe limits (128 mg/kg DM vs. 50-100 mg/kg) (Okafor et al., 2003). Many sorghum varieties contain tannins, which have detrimental effects on the nutritive value of the grain and its by-products, particularly for monogastric species. By-products that contain large amounts of testa tend to concentrate tannins and should, therefore, be cautiously used for poultry and pig feeding. It should be noted that tannins may or may not be considered beneficial for food production. In some traditional foods and beverages, the phenolics of red sorghum give a desired flavour and colour. In sorghum liquor manufacture, tannins inhibit harmful micro-organisms and increase productivity, while producing aromatic compounds that give sorghum liquors their special flavour. However, low-tannin sorghums without testa are preferred in the starch extraction process, as sorghum pigments can discolour the end product (NRI, 1999). White sorghums are also being promoted in West Africa for the brewing of lager beer due to their low levels of phenolics (INTSORMIL, 2008). Fresh sorghum by-products such as sorghum beer residues are prone to moulding, which may cause severe toxicity. In South Africa, 76 cows (from a herd of 100) developed a neurological syndrome (weakness of the hindquarters, ataxia and eventually paralysis) after consuming sorghum beer residues contaminated with Aspergillus clavatus over a period of 8 months (Lugt et al., 1994). Sorghum bran is available in peri-urban areas in some African countries (Boitumelo, 1993). In Botswana, sorghum bran included at up to 25% in the diet of crossbred cattle was found to be a suitable by-product, able to improve the nutritive value of the diet in both the dry and the wet season (Boitumelo, 1993; Kiflewahid, 1988). Sorghum bran fed at 1 kg per kg milk with a basal diet of sorghum stover met the requirements of a cow (450 kg, 5 kg milk/day) suckling a calf (Mahabile et al., 2000). Most of the trials with sorghum distillers' grains have been carried out in the United States with feedlot steers and dairy cattle. The overall conclusion is that sorghum distillers’ grains have a nutritive value higher than that of maize grain for finishing beef cattle and lactating dairy cows, notably due to the higher content in protein and lipids (Al-Suwaiegh et al., 2002; Klopfenstein et al., 2008). They can be included at 15-30% in beef cattle diets (Al-Suwaiegh et al., 2002; Klopfenstein et al., 2008; May et al., 2010; Wood et al., 2011). Inclusion levels of 15% (Al-Suwaiegh et al., 2002) and 30% (Chiou et al., 1999) have been proposed for dairy cattle. An additional benefit of sorghum distillers is that their lower starch content reduces the incidence of acidosis when they substitute for grains (Al-Suwaiegh et al., 2002; Lodge et al., 1997). The OM digestibility of sorghum distillers is quite high, in the 74-81% range (Lodge et al., 1997), though a much lower value (45%) has been observed for a sample with a high lignin content (more than 25% DM) (Cavani et al., 1990). Wet distillers' grains are a good source of undegradable protein (Chiou et al., 1999). They can be fed in combination with urea and this mixture has a protein efficiency close to that of soybean meal (Waller et al., 1980). When compared to corn distillers, sorghum distillers have a slightly lower or comparable feeding value (Al-Suwaiegh et al., 2002; Klopfenstein et al., 2008; May et al., 2010; Wood et al., 2011). In crossbred yearlings steers, wet or dried sorghum distillers’ grains included at 15% (diet DM) had no effect on meat quality (color, fatty acid profiles, lipid oxidation, tenderness and sensory attributes of the strip loins) compared to wet or dried corn distillers (Gill et al., 2008). Carcass characteristics of finishing yearling steers were similar with wet or dried corn distillers or sorghum distillers included at 30% (diet DM), but hot carcass weight was higher with distillers’-based diets than with rolled maize-based diets (Al-Suwaiegh et al., 2002). Sorghum dried distillers grains plus solubles can be included at 20% (diet DM), similar to corn DDGS, in grower and finisher diets, without negatively affecting overall growth or carcass traits. However, feeding sorghum distillers may reduce performance when maize silage based diets are fed, resulting in earlier fattening at a lighter body weight (Wood et al., 2011). It should be noted that experimental results are not always consistent, due to variations in processes and extent of heat damage (Cavani et al., 1990). For instance, the inclusion of 15% sorghum wet distillers’ grain plus solubles in finishing diets decreased feed efficiency and in vitro DM digestibility when compared to maize-based diets (Leibovich et al., 2009). Sorghum distillers' dried grains with solubles improved the health status of shipping-stressed calves, but depressed performance when compared to a mixture of soybean meal and blood meal (Koevering et al., 1992). In particular, there may be differences between dry and wet sorghum distillers, and the feeding value may depend on the absence or presence of solubles (Lodge et al., 1997). The form (wet or dry) of sorghum distillers's grain did not affect DM intake, rumen pH, volatile fatty acids, and in situ digestion kinetics of NDF from distillers’ grains when fistulated cows were fed 15% distillers’ grains (Al-Suwaiegh et al., 2002). The input of water from fresh distillers’ grains (up to 30% of the diet) may reduce DM intake in dairy cows, but it has a positive effect on fibre digestion as it slows down the rate of passage through the rumen (Chiou et al., 1999). In a digestibility trial with lambs, dried sorghum distillers’ grains with solubles had a lower OM digestibility than wet distillers without solubles, which could be due to the possibly higher rate of passage of the smaller dried grains (Lodge et al., 1997). In finishing crossbred yearling steers, adding solubles to wet sorghum distillers (40% diet DM) did not modify feed efficiency and daily gain (Lodge et al., 1997). In Taiwan, a maize-sorghum distillers’ grain silage fed with a concentrate to growing goats gave the same performance as alfalfa pellets but was more cost-effective (Su Ankuo et al., 2001). When available, sorghum wine residue can replace the concentrate for growing goats (Hsieh Weinchang et al., 2002). Sorghum gluten feed can replace up to 30-50% of the grain in cattle diets (Göhl, 1982; Riggs, 1958). Sorghum gluten meal can replace equal amounts of cottonseed meal in cattle fattening rations (Riggs, 1958). Research on the feeding value of sorghum distillers' grains in pig diets is very limited. Energy digestibility of sorghum DDGS ranges from 74 to 83% with an average value of 77% (Stein et al., 2009). As in other grains, energy digestibility is much lower for the DDGS than for the whole grain (i.e. 87% in growing pigs; Noblet et al., 2002), which can be explained by the higher fibre content of this by-product (Pedersen et al., 2007). Sorghum DDGS could be preferentially used for animals at physiological stages with lower energy requirements and/or for animals with a greater ability to use dietary fibre, such as adult sows (Pedersen et al., 2007). The standardized ileal amino acid digestibility of sorghum DDGS is generally lower than for wheat and maize distillers (Jacela et al., 2010), which may also result from their higher fibre content. However, because they have a higher protein content, sorghum DDGS contain more digestible essential amino acids than maize DDGS. However, as in DDGS from other grains, amino acid digestibility is quite variable in sorghum DDGS (Stein et al., 2009). This is particularly true for lysine and may be due to variations in heat damage occuring during grain processing (Jacela et al., 2010). Several experiments suggest that up to 30% sorghum DDGS can be used in post-weaning pigs without impairing growth performance (Tokach et al., 2010). Up to 30% and 40% sorghum DDGS can be used in diets formulated for growing and finishing pigs respectively (Stein et al., 2009). Based on results obtained from maize DDGS, sorghum DDGS could be included in gestation diets in amounts sufficient to replace soybean meal without negatively affecting reproductive performance. Lactation diets may contain up to 30% sorghum DDGS, but feeding this product should start during the gestation period to accustom the sows to it, thus preventing a reduction in feed intake during lactation (Stein et al., 2009). Although deficient in lysine and tryptophan, sorghum gluten meal has been described as a good protein supplement for maize-soybean meal rations for pigs (Wall et al., 1978). It should not exceed 4% of the total ration for pigs (Göhl, 1982). Tannins have a major influence on the nutritional value of sorghum products in poultry. Therefore, due to the potentially high concentration of tannins in sorghum by-products (see Potential constraints), feeding these products to poultry should be cautiously done. The literature on the nutritional value of sorghum bran for poultry is scarce. Bran obtained from tannin-containing varieties has a low nutritional value and should, therefore, be cautiously used in poultry. Bran obtained from white varieties has a higher nutritive value. However its high fibre content should limit its inclusion to about 10% in broiler diets and around 25% in layer diets. Dried brewers' grains should not exceed 10% of the diet unless its price can compensate for the decreased feed efficiency. The inclusion in broiler diets of 20% brewers' grains from both maize and sorghum did not alter the growth rate but lowered feed conversion because of a higher feed intake (Fasuyi, 2005). Locally produced sorghum brewers' grains, made of tannin-containing sorghum, decreased digestibility and growth performance, although not significantly, at 10% inclusion in the diet. Feed intake increased despite the presence of tannins, resulting in a lower feed conversion efficiency (Adama et al., 2007). When substituting sorghum grain + soybean meal with sorghum gluten meal in a broiler diet, growth performance was maintained up to 17% gluten meal (El Zubeir et al., 1992). However, in another experiment the inclusion of sorghum gluten meal above 10% in broiler diets decreased growth (Hamid et al., 1990). The recommendation can be set at 10% sorghum gluten meal for broilers, with an adequate amino-acid balance in the diet. The use of a sorghum germ meal rich in lipids (28%) decreased growth performance and feed consumption in broilers (Jubarah et al., 1992). Sorghum bran is used in Sub-Saharan Africa for rabbit feeding. In Mozambique, it has been described as a product traditionally used by rabbit farmers (Mgheni, 1979). In Nigeria, sorghum offal introduced at 52%, as the main source of energy in a balanced diet, slightly increased growth rate and carcass yield when compared to the maize-based control diet (50%), though not significantly (Uko et al., 1999). Another experiment found that it could be cost-effective to replace 100% of maize grain with sorghum offal even though it tended to decrease performance (Adeniji et al., 2003). A later trial recommended a maximum inclusion rate of 20%, as 30% sorghum bran in the diet depressed performance (Oso et al., 2011). These varied results show that the inclusion level must always be determined after considering the global nutritional balance of the diet. 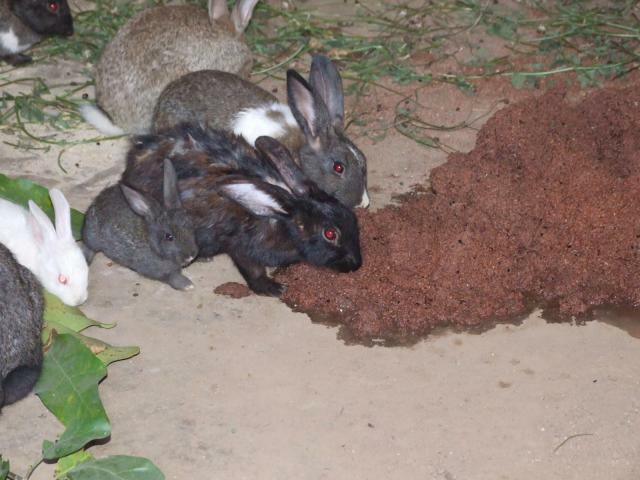 In West Africa, fresh sorghum brewer's grains are often fed directly to rabbits, and appear to be very palatable: rabbits eat them as soon as they are distributed (Lebas, 2006). This fresh product should be consumed within 12 hours of its production to avoid mould formation. Dried sorghum brewers' grains can be the only source of protein in complete rabbit diets (Balogun et al., 2004 cited by Adama et al., 2007). Malted sorghum sprouts are a source of protein. They have been used at up to 20% in rabbit diets (and even 30%, but this level caused a slight reduction in growth rate and carcass weight) (Jegede et al., 2006). However, diet digestibility and haematological characteristics were negatively affected by increasing levels of sorghum sprouts (Jegede et al., 2008). In Nigeria, these starch by-products have been considered as potential ingredients for rabbit feeding (Onifade et al., 1999). NRC, 1981. Feeding value of ethanol production by-products. Committee on Animal Nutrition. National Academy Press, Washington D. C.